Photographer(s) Appreciation: Thank you once again to Mats Ellting@Flickr for another beautiful photo, Mentzelia lindleyi, via the Botany Photo of the Day Flickr Pool. Some references suggest Mentzelia lindleyi is native to both California and Arizona, but its presence in wild environments outside of California’s Bay Area is due to escapees from cultivation (see: Mentzelia lindleyi in the Flora of North America). Habitats include coastal sage scrub and oak-pine woodland plant communities, as well as exposed rocky sites. Accordingly, Lindley’s blazingstar is heat-, wind-, and drought-tolerant. Lindley’s blazingstar is often grown either as an ornamental in flower beds or for pollinators in wildlife gardens. 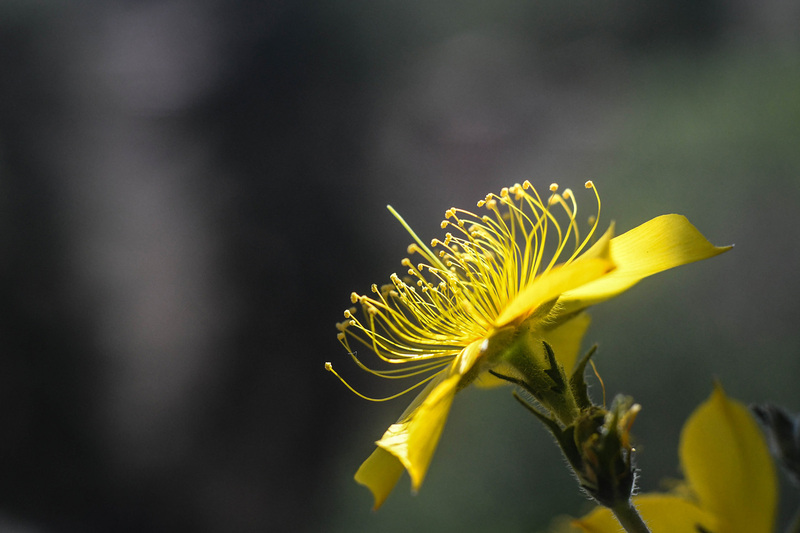 Much like its common name suggests, blazingstar has a blossom of five vibrant yellow petals. Above the petals are more than twenty stamens and one compound pistil. Each fragrant flower is approximately 7cm (2.75 in.) in diameter; these open late in the day and typically close by mid-morning. The 30-60cm tall (1-2 ft.) plants bloom in late spring, bearing 25-35 flowers on hairy, multi-branching, straggly stems (see CalPhotos: Mentzelia lindleyi). Welcome to Nathalie as a new work-learn student writing / photographing for Botany Photo of the Day from now until the end of April! Nice start, Nathalie. Welcome… looking forward to more! Looks like we don’t have at UBC Garden this plant or anything else from so new to me Loasaceae family. Can we hope to see it? Thank you all contributors for this site which provides fresh food for the mind and eyes. Thank you Nathalie, what a great start. I am amazed. What a beautiful plant. Thank you all goes this awesome site.